Do you love to online shop? What about finding great deals? Yeah, me too! So today I have a great introduction for you. The one, the only, Shop It To Me! “Shop It To Me is an effortless way to find sales on more than 700 brands.” I couldn’t have said this better myself. 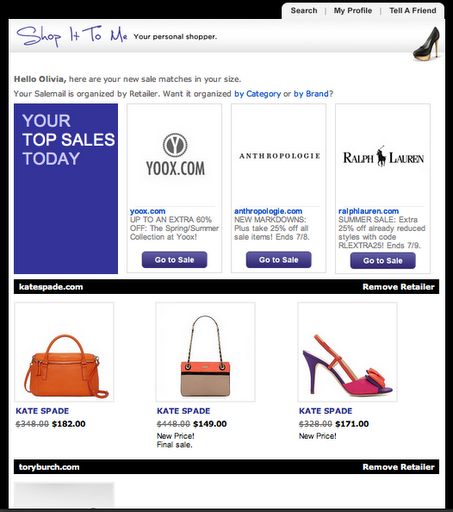 Shop It To Me works like an email newsletter. You tell it what brands you love (they’ll even provide suggestions for you based off what you’ve chosen & give you a list of some up & coming designers!) and what you’re shopping for. You can shop for women, men, kids, accessories and sort it by size! Then you set your email preferences; I love getting mine on Tuesdays and Fridays. That’s it! You’ll get your first ‘salemail’ shortly. I’ve been using Shop It To Me since January of 2011. I love it! To me it’s like a deal seeking online shopper’s paradise, all wrapped in a pretty package! The emails are really easy to read, the item and price are right there for you. Shop It To Me has a great selection of brands and options so you can always find what you’re looking for! Interested in signing up? You can do so here. Check out this interview on Levo League Office Hours with the CEO & founder, Charlie Graham. You can find it on the Levo League Office Hours website here.